In order to study the Earth as a whole system and understand how it is changing, NASA and other space agencies develop and support a large number of Earth observing missions. These missions provide Earth science researchers the necessary data to address key questions about global climate change. At PO.DAAC, we focus on NASA missions related to physical oceanography, covering Sea Surface Temperature, Sea Surface Salinity, Ocean Surface Topography, Ocean Wind, Gravity, Ocean Currents & Circulation. 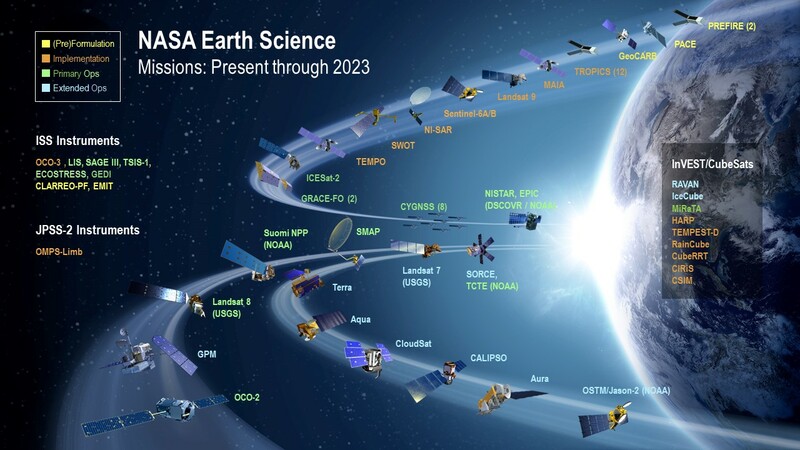 Image Caption: This graphic shows NASA's Earth-observing missions: present through 2023.